RISC based Touch Panel PC OnRISC VS-860 now available. 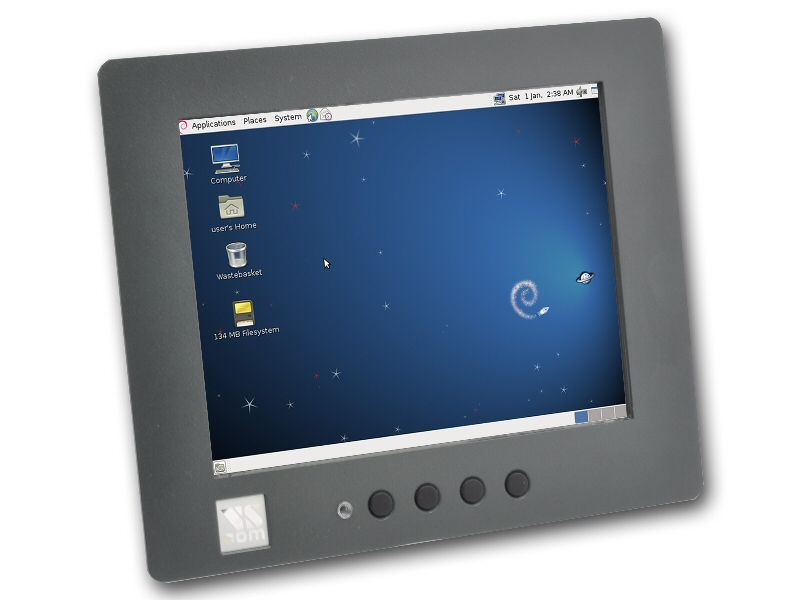 December 11, 2013 - VS Vision Systems GmbH - Industrial PC provider - presents the OnRISC VS-860 system, a RISC based Touch Panel PC. It comes with an 8" display with resistive touch function. Based on a modern Sitara ARM Cortex-A8 RISC processor (600 MHz) from Texas Instruments, it has low power requirements. At the same time the performance is sufficient for several tasks in industrial monitoring and control applications. Those tasks are also supported by many options for connectivity. The system may boot from a SD-card, or from internal Flash memory. Among other functions it provides two independent network ports for Fast Ethernet, two ports for USB 2.0 devices, two serial ports and a connector for CAN bus. Further there is a USB/OTG port for system developers, a slot for a SIM card plus a slot for CFast mass storage cards. Audio is available also. Possible internal extensions are for a GSM/3G/4G card, and WLAN function. The VS-860 supports Windows Embedded operating system, version Windows CE 6 is evaluated and available. VS Vision Systems GmbH will offer prepared SD cards to install and boot from. As with all the other OnRISC models Debian GNU/Linux is available as operating system. Vision Systems provides a sample installation of this operating system, an image file prepared for a SD card. Debian for VS-860 is planned to come with Kernel 3.2 initially. System Developers may also use buildroot as their Linux distribution, a sample configuration is provided. The manual covers instructions to generate a system using buildroot. This can result in a system small enough to fit into the internal Flash memory. Adapting Android for VS-860 is under consideration right now. The VS-860 has a display 8" in size, with a resolution of 800×600. It is bonded with a resistive touch panel, still with high luminosity in the display. For display control VS-860 uses a PowerVR SGX530 3D engine. This supports the software interfaces of OpenGL-ES 1.1+2.0, Direct3D Mobile, OpenVG 1.0 and OpenMax. The display panel is covered by a front bezel, this also holds one Power LED and four buttons. One button is to switch power, the other three are functional defined by customers application (softkeys). The front bezel is classified as IP 65. The three-way serial ports of VS-860 can connect to RS485 field busses in industrial installations, even if operating on high bitrates. The CAN bus also provides field bus connectivity, up to 1 Mbit/s. To operate and test the CAN port Linux may use the VSCAN API or the SocketCAN functions. Field busses on Ethernet are a third class of possible connects.